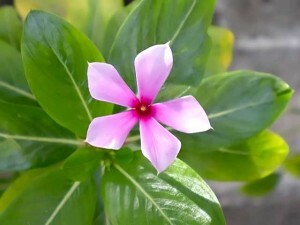 Periwinkle was my maternal granny’s favorite flower. I grew up in her house in Ajmer. That was when Mom was working as a primary teacher and my father was in Delhi working on his Ph.D. Those were happy days with no responsibilities and very little tensions. I think there are several posts with that theme already so I won’t indulge in the same rhetoric. This is just about my granny’s favorite flower. One of my earliest and endearing memories is my granny softly chanting her daily morning hymns while the fragrance of sandalwood permeated through the whole house. She used to come to wake up the kids and get us ready for school. But before all this, we used to go out in the balcony where there were many periwinkle flower pots. So many that I have no memory of ever having less than a dozen periwinkle in full bloom. These flowers bloom the whole year long irrespective of the weather. All they seem to need is love and a little water. Granny provided more than enough of both. As we got up in the morning, it was my responsibility to wash my hands and pick a few of these flowers for daily offering to the gods. I looked forward to this each night before I went to bed since I was convinced, in no small part thanks to my granny’s goading, that this was one of the most important parts of the morning prayers. I was thrilled with the responsibility bestowed on my four year old shoulders. I would religiously wash the flowers and set them in the plate used for prayers along with the remaining stuff piled in there. She loved these flowers and told me more stories about them than I remember. Most of the rituals in Hinduism are associated with a god to keep the practice consistent. And periwinkle is no exception. It too has a deity associated with it and using it as an offering brings about overall wellness that may be hard to achieve otherwise. My granny was not a literate woman though I remember her being able to write her name. But she knew stories, tones of stories for every imaginable event in life. Naturally, most of these were religious in nature but some were not. I am amazed at her memory and recall of stories she herself claimed she learned as a child. She died about fifteen years back because of general ailments of old age. I think she was around seventy-five at the time. Anyway, I was also responsible for removing these flowers from the small temple we had in the house in the evening of each day. This was just before the evening prayers which didn’t require any flowers. Just incense and a lamp fueled by vegetable oil. Every evening I would take the flowers sitting before the deities and collect them in a bag. And when the bag was full of these dried flowers (took a few months) then an elder would go and submerge them in the local lake. Sometimes I would go with him or her to the lake for the small ceremony. What I remember most is the mild fragrance of these flowers. They are very lightly perfumed, barely noticeable unless you know what you are looking for. So in her memory I have planted almost twenty of these flowers around the house. And we always have periwinkle growing in our house throughout the year. I hope we always do, they remind me of those happy days and of Amma.